Even with health and wellness trends top-of-mind with consumers, indulgent bacon continues to provide opportunities for innovation and appeal to menus. Innovation can be built on preparation, spice profiles and mixing the salty, smoky and savory flavor of bacon with sweet and hot. There seems to be no end to the bacon trend, and we continue to see innovation across the restaurant landscape. In the quick-service sector, Little Caesars Bacon-Wrapped Crust Pizza places bacon on the pizza and now around the pizza. In fast casual, Panda Express improves the already craveable Orange Chicken by adding bacon (with a premium price point) for customers who can’t get enough. Full-service chain LongHorn Steakhouse adds the Triple Bacon Sirloin to the mix, with its Fire-Grilled Sirloin wrapped with bacon, topped with bacon and finished with bacon tomato Hollandaise. 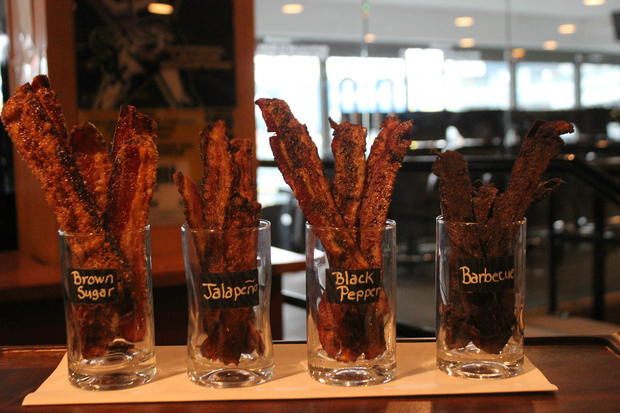 In the recreation segment, White Sox fans at Cellular Field will be able to order bacon flights that include brown sugar, jalapeno, black pepper and barbecue flavors, or just bacon on a stick, improved this year with a maple glaze. One thing is clear: The trend in bacon continues to drive innovation and growth, and there’s no end in sight. Fans of the smoky salty protein just can’t get enough. This entry was posted on Tuesday, April 7th, 2015 at 8:37 am and is filed under Bacon, Fast Casual, Flavor, Full-Service, Menu, Menu Development/Innovation, Menu Trends, Quick Service, Recreation. You can follow any responses to this entry through the RSS 2.0 feed. You can leave a response, or trackback from your own site.